Back in the 70's A New Hope paved the way for modern special effects in film, and today the Star Wars saga remains on the cutting edge cutting edge of filmmaking techniques with The Force Awakens. The Visual Effects of Episode VII were especially impressive due to the many CGI ships, environments and characters that were created by the incredibly talented artists at Industrial Light & Magic. Wired has released a brand new featurette focused on the VFX of The Force Awakens, in which they take a behind the scenes look at ILM's Oscar nominated work. 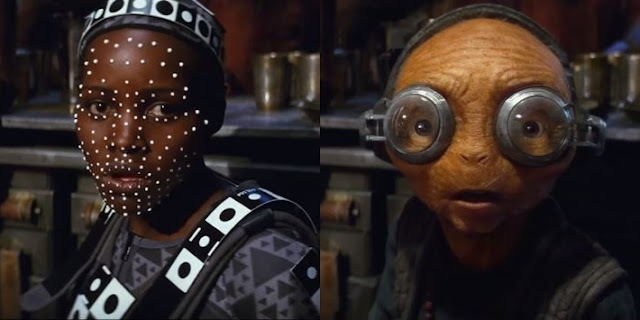 Watch the video below for comparisons of scenes with and without CGI, as well as a look at the motion capture process that brought Maz Kanata and other characters to life onscreen.